Research focus on Natural Science and Anthropogenic Sciences. Research focus on Community and Economic Development, Public Health, Landscape, etc. Research focus on Policy and Law, Development and Spatial Plan, REDD, etc. The United Nation – Sustainable Development Solution Network (UN – SDSN), alongside United in Diversity (UID) Foundation, had established a regional workshop entitled Priorities and Pathways for Sustainable Energy and Deep Decarbonization in Indonesia. The workshop took place at Hotel Aryaduta, Jakarta, for two days on 26 – 27 November 2014. 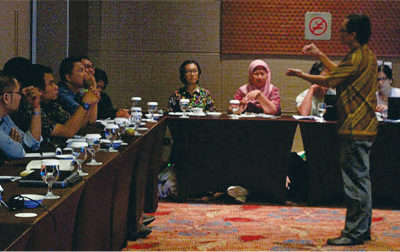 The workshop was organized as a by-invitation event and co-hosted by Ministry of Environment and Forestry, directly under Minister Siti Nurbaya. 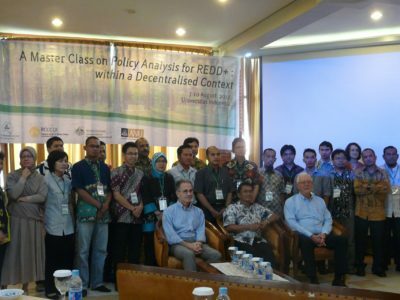 The workshop was also organized by collaboration of University of Indonesia (UI), UID, and Monash University in partnership with Carbon War Room, Australia – Indonesia Centre, and Harold Mitchell Foundation. Research Center for Climate Change – University of Indonesia (RCCC – UI) together with Faculty of Mathematic and Natural Science – University of Indonesia (FMIPA – UI) have been conducting a seminar on the topic of National Parks and Ecosystem Services on September 5, 2014. The seminar was held at Balai Sidang UI and the participants were coming from various institutions such as Akademi Ilmu Pengetahuan Indonesia (AIPI), Ministry of Forestry RI, Ministry of Research and Technology RI, Restorasi Ekosistem Indonesia, Ltd., Conservation International, Kehati, and students from another universities. Climate change is a natural phenomenon which becomes more complicated in terms of prediction due to various dimensions such as ethics, politics, economics, and humanity which affecting one another. This has been acknowledged and has been an important issue by many of UI’s scientists through their research topics. Through Research Center for Climate Change (RCCC–UI), some of scientists represent multi-disciplinarians and knowledge, and thus become the great opportunity to influence the nation’s policy developments as well as supporting adaptation schemes of local people. Research Center for Climate Change University of Indonesia (RCCC-UI) have done some project since its established in 2010. Many activities include research program, simposia, training and workshops, general lecture of climate change related issues, and exhibition events. This shows the summary for some our project that describe by slide of photos and narratives, our engagement are not only on physical aspects of climate change, but also social and economical aspect. Supporting sustainable development goals and take it as an opportunity on development issues. RCCC – UI was establish in 17 October 2010. As the centre for research and community services, with the research results DRPM UI . Lab Multidisiplin FMIPA Building 7th fl.